If you've been desiring one of these on your wrist, here's your opportunity. These watches or wait- Wrist PDAs never seemed to take off probably because they looked so dated when they came out. Still, I think its a cool idea, but not one I would want to wear because of its chunky clunky design. 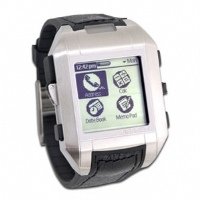 I think MS Spot watches have done better and if Fossil could do a port of that for a Palm Watch that would be sweet.